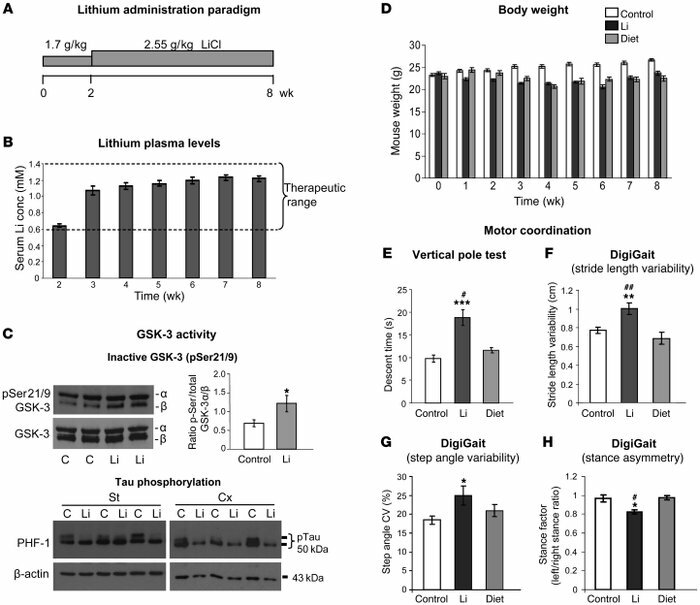 Reduced brain GSK-3 activity and impaired motor coordination induced by chronic lithium administration at therapeutic doses. (A) Diagram showing lithium administration protocol. (B) Lithium plasma levels across the 8 weeks of feeding with lithium-containing chow (n = 38). conc, concentration. (C) Upper panels: Western blot detection and quantification of inactive GSK-3 (pSer21/9-GSK-3) in homogenates from striatum of control and lithium-treated mice (control [C], n = 8; lithium, n = 8). Lower panels: Western blot detection of phosphorylated tau (PHF-1) in homogenates from striatum (St) and cortex (Cx) of control and lithium-treated mice. (D) Body weight over the course of treatment in control (n = 16), lithium-treated (n = 24), and calorie-restricted (diet, n = 8) mice. (E) Descent time in vertical pole test (control, n = 28; lithium, n = 25; diet, n = 8). (F–H) Analysis of gait parameters in footprint test as measured by DigiGait system (control, n = 23; lithium, n = 17; diet, n = 8): stride length variability (F), step angle variability (G), and stance asymmetry (H). *P < 0.05, **P < 0.01, ***P < 0.001 versus control; #P < 0.05, ##P < 0.01 versus diet.